There's a unique twist in the legs of the Amish Lexington 2-Door Sideboard. 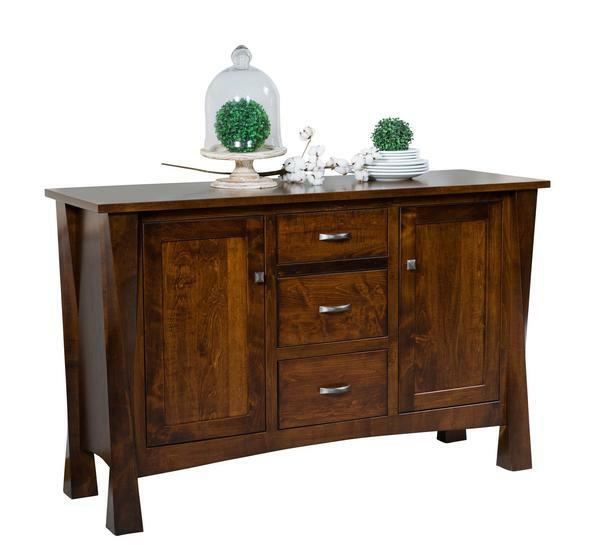 This sensational solid wood sideboard adds storage in style. Equipped with three center drawers that are flanked with two cabinets, the Lexington is ready to serve and be seen in living room, dining room, foyer, or wherever additional storage is needed. The Lexington is shown here in brown maple wood with Asbury stain. Customizing your furniture is made possible at DutchCrafters. We love learning about your plans for new furniture and assisting as you create your own look with wood, finish and custom features. Click on your options on the Select Options page and save time running from furniture store to furniture store. If you'd like personal service we are here to help. You can email or call a Furniture Specialist with any questions or concerns. Thank you for shopping with DutchCrafters. Shown in Brown Maple with Asbury.